Weren’t the “winged things” projects just darling? Here are the instructions for the two cards and for Kim Hughes’s mini book (found on pages 40 and 41 in the Spring 2009 issue). Cut the pinking edged paper to 4.75 x 5.5 and mat onto a taupe cardstock base. Add a 2 x 4.75” pink polka dot piece of paper to the bottom of the card. Stamp sentiment and add purple glitter to the hearts. Wrap blue lace around the card and attach onto the backside. Punch circles to add on top of the owl’s eyes. Hand stitch a frame around the owls (straight line in purple and a zig zag in green). Add rhinestone and button accents to tree. Punch 2 small brown eyes and punch 1 white circle; cut it in half and add on top of the pupils. Machine stitch holes (without thread) for easier hand sewing. Using a glue pen is best when applying glitter to small areas. Paint entire album with white paint. Trace cover onto the back of butterfly paper, cut out; add to cover and sand edges. Print all words of encouragement onto smooth white cardstock, cut down and mat onto coloured papers. Add title and butterflies to the cover. Cover chipboard pieces with paper and add center accents. Cut a dragonfly and owl shape from patterned papers and use them as accents. Cover each bird tail with a different coloured paper and sand the edges. Tie a green knot in the chain. Add eyes to each bird. Make a 5.5 x 4.25 “ card from cream cardstock. Cut a 5.25 x 4 “ mat from blue cardstock; adhere to card front. 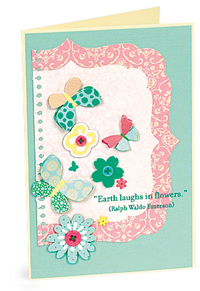 Tear a journaling spot from the Making Memories Flower Patch spiral journaling book; adhere to card front as shown. Cut a variety of butterflies from patterned paper; bend wings; adhere as shown to card front using dimensional adhesive. Adhere chipboard flower stickers as shown.